Navodaya Vidyalaya Samiti has issued recruitment notification of 683 Non Teaching Vacancy (LDC/ Steno, Staff Nurse & Other Posts) under Head Quarters & JNVs. Applicants who are interested in Non Teaching Jobs can fill online application form for Navodaya Vidyalaya Vacancies. Closing date for submitting NVS Vacancy Online form is 13.12.2017. 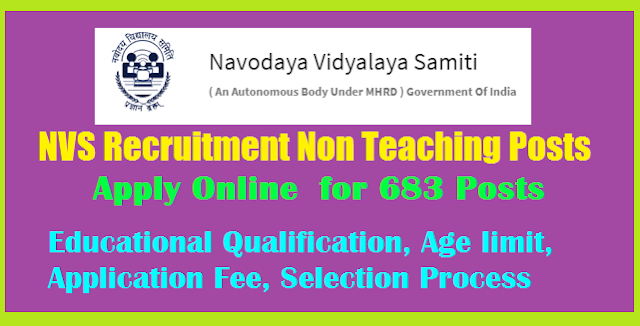 NVS is also known as Navodaya Vidyalaya Samiti, Department is inviting online application for appointing Candidates on 683 various Non Teaching Vacancies. This is great Chance to Fill NVS Online form for those candidates who are searching Non Teaching Jobs. Online registration for NVS Non Teaching Vacancies has been started from 12.11.2017. To get more information about Navodaya Vidyalaya Recruitment like Age, Education Selection etc. you can collect by reading the below article. Navodaya Vidyalaya Samiti, henceforth mentioned as NVS is an Autonomous Organisation under Ministry of Human Resource Development, Department of School Education and Literacy, Govt. of India having its HQ at NOIDA (Uttar Pradesh). It has 08 Regional Offices at Bhopal, Chandigarh, Hyderabad, Jaipur, Lucknow, Patna, Pune & Shillong and more than 600 Jawahar Navodaya Vidyalayas which are co-educational, fully residential schools up to Senior Secondary Level and located mainly in rural areas, all across the country except in the State of Tamil Nadu. NVS invites online applications from Indian citizens for recruitment to various non-teaching posts viz Female Staff Nurse, Catering Assistant, Lower Division Clerk/ Storekeeper, Lab Attendant in Jawahar Navodaya Vidyalayas and for the posts of Audit Assistant, Hindi Translator, Stenographer, Lower Division Clerk in NVS HQ / Regional Offices. NVS Recruitment 2017: Navodaya Vidyalaya Samiti (NVS) is inviting Online Application forms for all eligible candidates to fill up 178 Non Teaching Staff Vacancies. The Direct link of the official NVS Recruitment 2017 Notification has provided for the candidates i.e., www.nvshq.org. Remaining details like Educational Qualification, Age limit, Application Fee, Selection Process are given below. Applicants who are applying for NVS recruitment will be selected as per below criteria. Schedule of examination will be intimated with the Admit Card. Detailed examination schedule will also be notified on NVS website www.nvshq.org / www.nvsnt2017.org in due course. 4. After hitting on above given link a new window will be opened with complete details. 10. At last hit final submit tab and take hard copy of it for further use.